Medical practice and learning in the vibrant city of Salerno were nourished by the Greek past of southern Italy, favored by healing shrines in the tradition of Cos and Epidauros, energized by trade with Sicily and across the Mediterranean, and fostered by monastic bibliophiles at Monte Cassino. The fame of Salerno's practitioners, women as well as men, had spread across Europe by the end of the eleventh century, when it was surpassed by the distinction of its teachers and eclipsed by the bookish legacy of the monk Constantine the African (d. 1087). 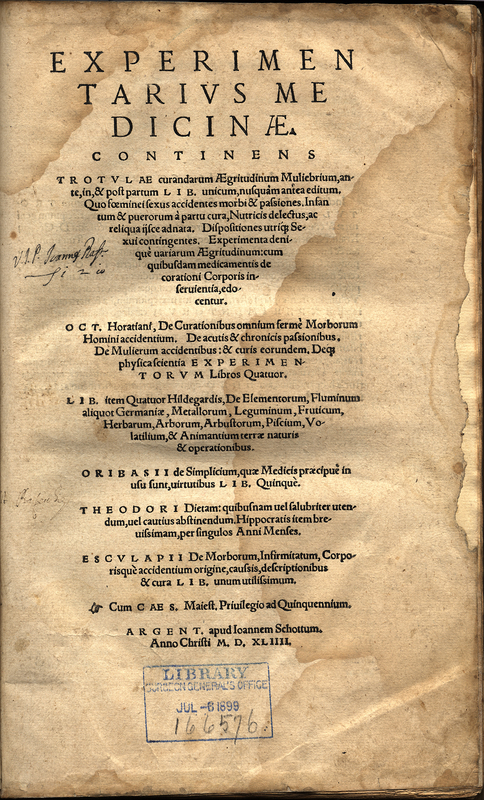 Nevertheless, practical concerns remained manifest even in writings of Constantine, for example the Viaticum, a medical guide for travellers. Summaries of all medical knowledge commonly bore the title Practica. Common-sense dietetics were compiled and soon became popularized as the Regimen of the School of Salerno "for the King of England." Through the twelfth century, Salernitan masters showed a growing interest in theoretical foundations. 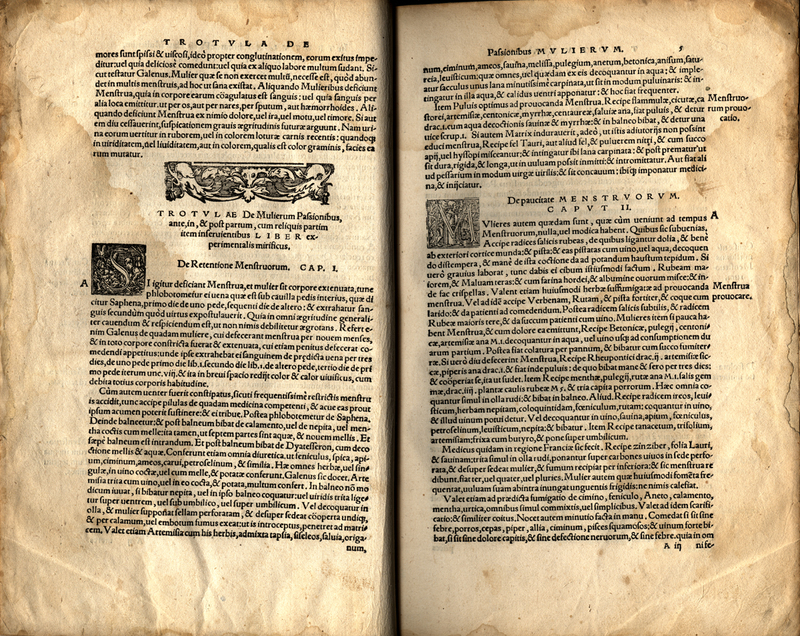 They speculated about natural philosophy in numerous Questions, drew on Aristotle's views of nature (physis) which contributed to the labeling of medicine as physica or physick, (hence "physician") saw the need of a better knowledge of anatomy, and pursued dialectical inquiry in their commentaries on authoritative treatises. Principles and procedure were interwoven in encyclopedic manuals of which the Breviary on the Signs, Causes, and Cures of Diseases by Joannes de Sancto Paulo is a model. Both theory and practice were envisioned in the selection of a few simple works for basic medical education, anchored in the Hippocratic-Galenic "Art" and eventually standardized in the Articella. Salerno's empirical orientation endured in the compilation of ob-gyn lore known as Trotula, while its theoretical contributions were preferred by a Scholastic master such as Gerard de Berry who wrote a Commentary on the Viaticum of Constantine. 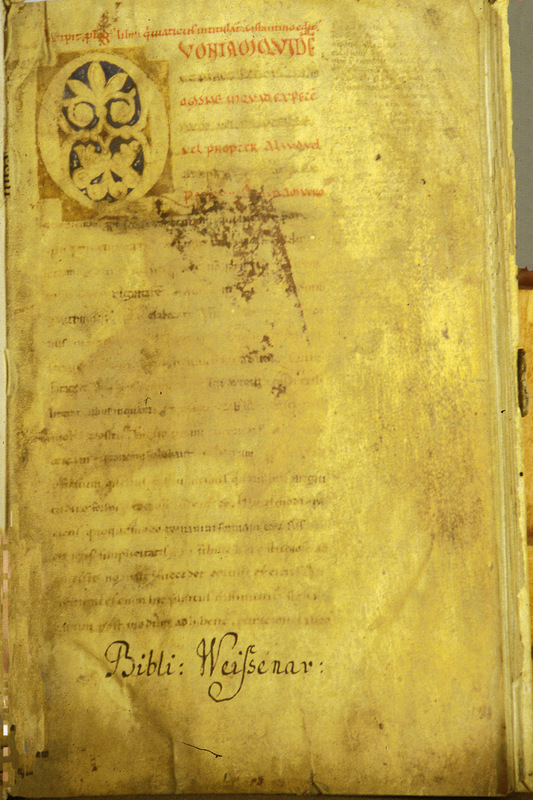 The reach and durability of Salerno's influence is documented particularly in the large number of Salernitan manuscripts that are extant in English libraries. 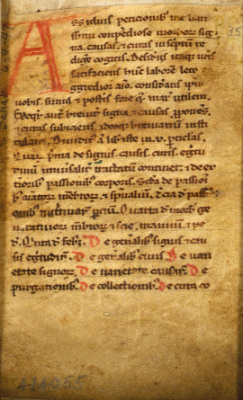 Breviarium de signis, causis, et curis morborum. (Breviary on the Signs, Causes, and Cures of Diseases) 13th century. 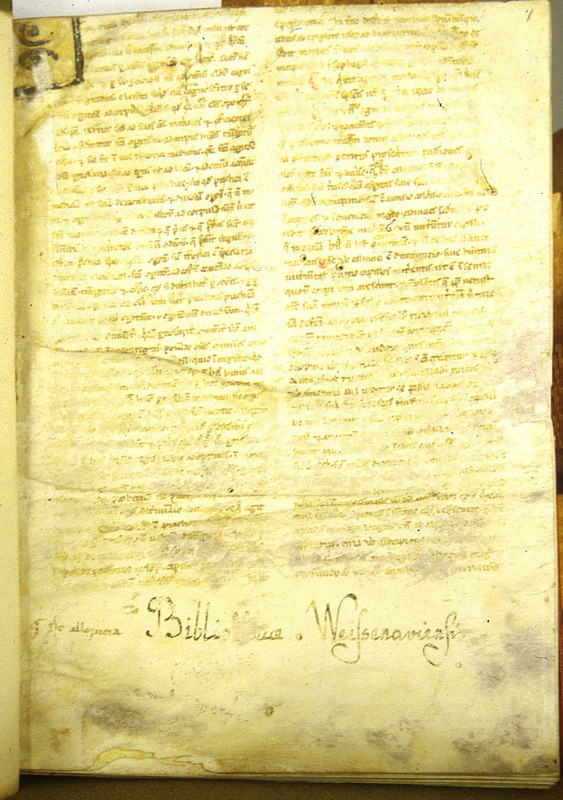 This Salernitan manual was widely copied across 13th-century Europe. 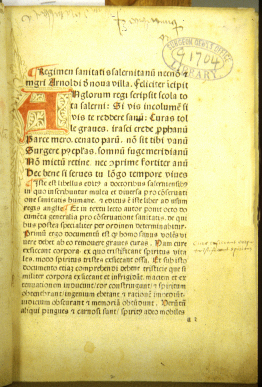 A commentary on Constantine's Viaticum with the original text shown by the underlines. 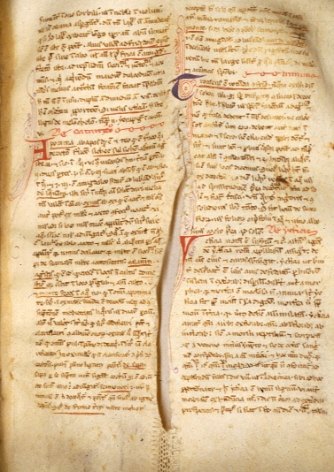 The remains of an elaborate medieval mend is seen on this page. 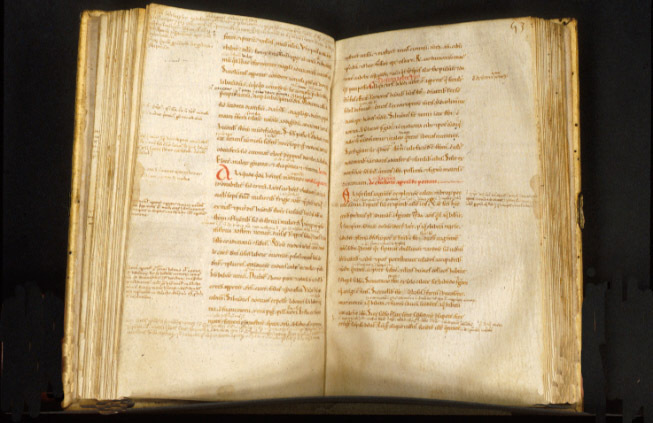 This manuscript contains marginal annotations in many different hands - at least five on this page alone - showing that it was a heavily used text. 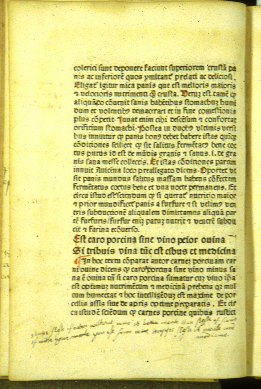 Regimen sanitatis Salernitanum. Louvain : Johannes de Westfalia, ca. 1480. Is better meate then flesh of swine. Hogges flesh is meate and medicine. 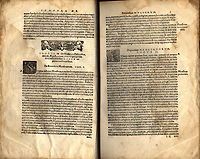 Experimentarius medicinae. Argent[orati] [i.e. Strasbourg]: Apud Joannem Schottum, 1544. The name Trotula, while actually the title of a compilation, has most frequently been assigned to a female teacher in the schools of Salerno. Whatever her name, a Salernitan woman appears to be the source of much in this treatise on diseases of women attributed to Trotula.